Based on the successful format of the original story, The Gruffalo’s Child follows the adventure of the Gruffalo’s daughter as she goes in search of the Big Bad Mouse that her dad warned her about. Along the way she is greeted by three different animals a snake with a long tail, an owl with big bright eyes and a fox with long whiskers. Once again the mouse comes out on top with his fast thinking and trickery. 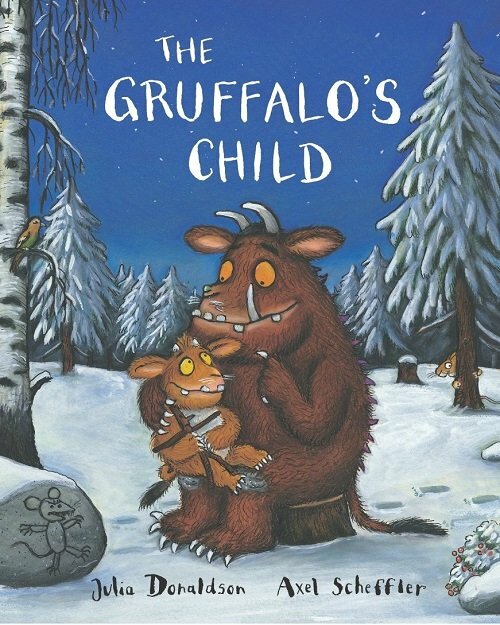 The Gruffalo’s Child is a fantastic rhyming book that will capture little ones’ attentions with its engaging illustrations and relatable characters. The repetitive phrases, such as, "the snow fell fast, and the wind blew wild, ‘I'm not scared,’ said the Gruffalo's Child." allow children to join in with the story and anticipate rhyming words. This picture book is also ideal for targeting describing through the use of adjectives, such as “deep dark wood” and “big bad mouse”. For further speech and language targets in the Gruffalo’s Child, see the list below.